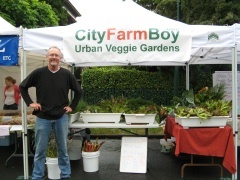 The City Farm Boy is actually a man, and, true to his title, he is an urban farmer. He has small patches of farmland spread out in Vancouver within 5 miles of his house. He bicycles around and farms in the backyards of people who don’t want to be responsible for their own garden but who support the idea of growing food locally. The City Farm Boy operates as a CSA (community supported agriculture) meaning you pay a set amount in advance in the spring and then enjoy a box of freshly picked bounty every two weeks all summer. If there is a lot of produce, you get a lot, if there is a little produce, you get a little. Well, this week, we got a lot! An entire reusable plastic bin full of carrots, beans, lettuce, corn, grapes, beets, squash, tomatoes, swiss chard, and some white root-like things (that I have never seen before but will enjoy nonetheless).-Update, Rhyannon has informed me that they are some sort of radish. A friend of mine is also part of a CSA and he told me about the somewhat comical ‘veggie pressure’ side effect of being part of a farm instead of just getting regular organic delivery. In the late summer the harvest was at it’s largest, and he became nearly overwhelmed by produce. He was freezing and canning and making soup like crazy just to get through his weekly delivery, only to be confronted 7 days later with another huge box. Imagine the panic! I guess that’s why the City Farm Boy has boxes every two weeks instead of every week – less pressure. Besides being packaging free and local, the excitement of surprise bounty far outweighs anything you might get at the grocery store. And in case you’re worried you’ll miss out on the pleasures of the local saturday farmer’s market, you can always still buy bread and cheese and eggs. If you prefer to grow your own garden, City Farm Boy builds beautiful, custom, raised garden beds filled with nutrient rich, organic soil. He also does workshops around Vancouver. And no he hasn’t hired me as a promoter. I just really believe in what he’s doing. Imagine a city where every front yard was filled with fruits and veggies instead of squares of unused grass. I don’t think it’s idealistic; I think it’s starting to happen. Check out The City Farm Boy website for more info (-also thanks to CFB for the images in this post). Sounds wonderful – what a gift! Hey Jen, I’m really enjoying your posts! someone just sent me this video, i thought you might like it, and maybe it’s a little more motivation to keep going. talk to you soon!